What if our household machines would not move by themselves but we would have to actuate them with our own body movements? What if they would just repeat our motions? Washing clothes used to be hard work until the domestic automatic washing machine was invented. Since then washing clothes became more and more a passive act. Today we just press few buttons and receive our freshly washed laundry 90 minutes later. 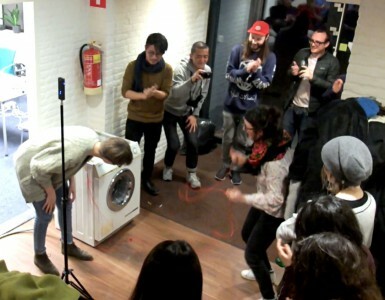 During a three day hackathon the concept and basic prototype for this interactive washing machine was developed. By hacking an old washing machine and learning the basics of arduino we managed to start the machine by moving our arms in circles.